This past weekend at the farmer’s market, I found a place selling organic watermelon and canteloupe. I figured this might be one of the last times to actually get a watermelon seeing as how it is now the end of September, even though our Los Angeles weather here doesn’t show that. So this morning I decided to make a juice with that delicious watermelon. 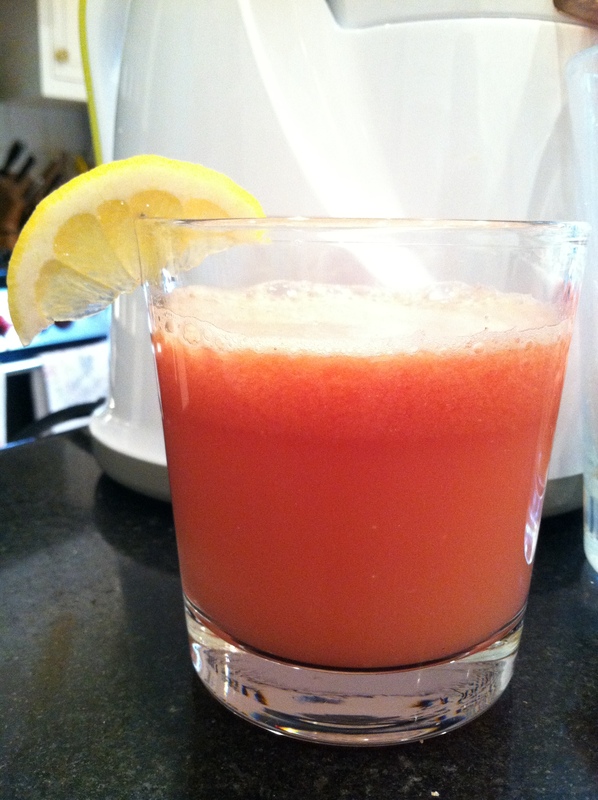 I ended up making a light, tart, and refreshing juice with watermelon, apple, lemon and ginger. Start by washing your apple. Then cut your apple into smaller pieces that will make your juicer happy. Move onto your watermelon and get chopping. I found that two 1/2 inch thick slices of watermelon gave me just a little more than 1.5 cups. Obviously this will change based on how big your watermelon is but I wanted to give you a little reference. Wash your lemon and cut it in half. To prepare it for juicing, cut the yellow rind off but leave as much as the white as you can on the lemon. Also cut a 1/4 inch thick slice of ginger and remove the exterior of it. Now you are all set to juice! I started by putting my ginger and lemon in the juicer and then followed with alternating pieces of watermelon and apple. Putting the ginger and lemon in first will allow the watermelon and apple to help push through as much of that ginger juice and as much of that lemon juice as is possible. Once this is all juiced, you’ll have one cup of this delicious watermelon apple lemon ginger juice to enjoy immediately! I enjoyed this juice for breakfast with a piece of toast with hummus on it. You could also have this watermelon apple lemon ginger juice as a pick me up in the afternoon. Enjoy! One cup of this juice will give you 167 calories and 43 grams of carbohydrates. It will also give you 510 milligrams of potassium and 2 grams of protein. You’ll receive 3% of your daily vitamin E, 18% of your daily vitamin A, 22% of your daily vitamin B-6, and over 100% of your daily vitamin C from one serving of this juice. 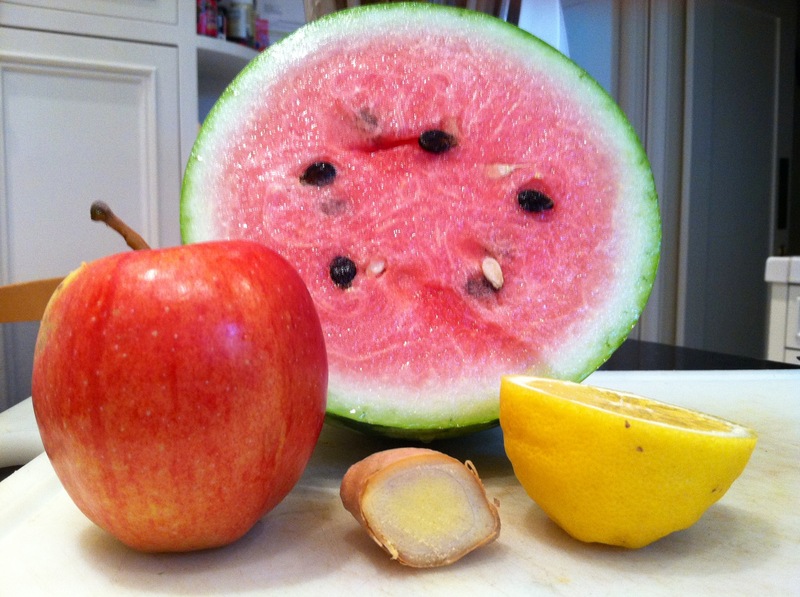 This watermelon apple lemon ginger juice will also provide you with a multitude of minerals. Some of those include: 5% of your daily riboflavin, 9% of your daily magnesium, 13% of your daily copper, and 15% of your daily thiamin.